With the new healthcare bill, 32 million more people will be looking for Doctors.?? This will inevitably lead to a doctor shortage.?? Apparently, nurses think it’s a good idea for them to be empowered — even to be called “Doctor”, even though they’re not real medical doctors.?? No thank-you. Nurse practitioners argue there’s no danger. They say they’re highly trained and as skilled as doctors at diagnosing illness during office visits. 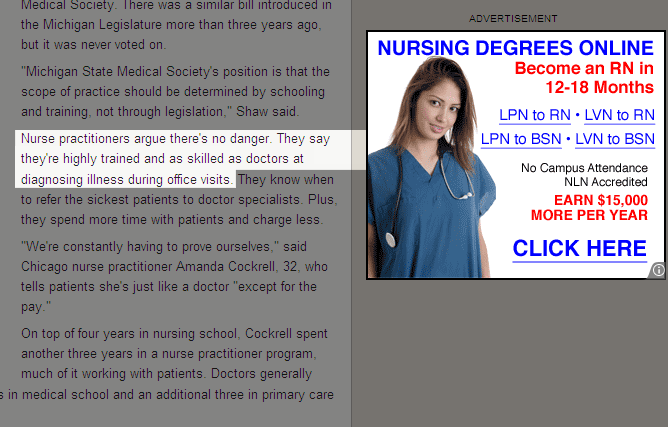 What’s ironic is directly to the right of that quote was an ad for nursing degrees.?? Somehow, this does not help my confidence.